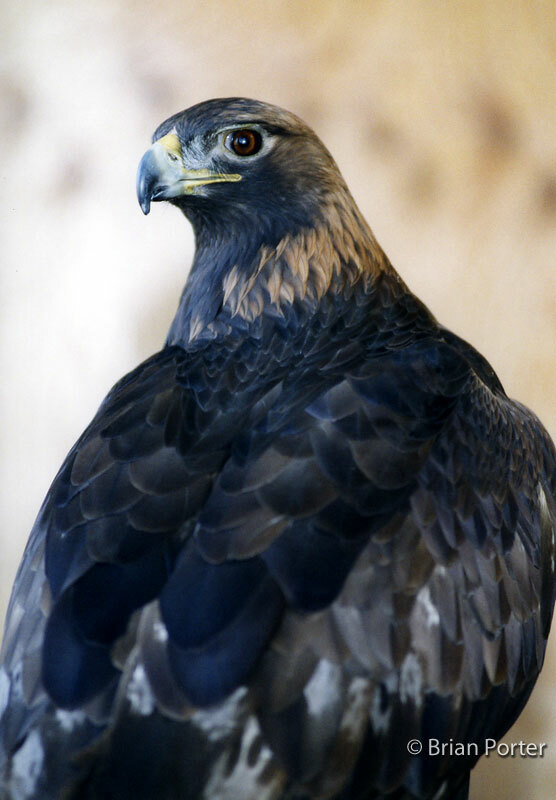 The Golden Eagle is the national bird of Mexico. In Mongolia, Golden Eagles are still used in the sport of falconry. Eagles are used to hunt prey, including rabbits and even wolves. Some Golden Eagles eat tortoises. Because a tortoise shell is too hard to break into, the eagles carry the tortoises in their talons and fly high into the sky. 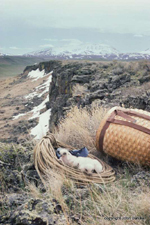 Once over a rocky outcrop, they drop the tortoise and its shell breaks open, providing easy access to the meat inside. 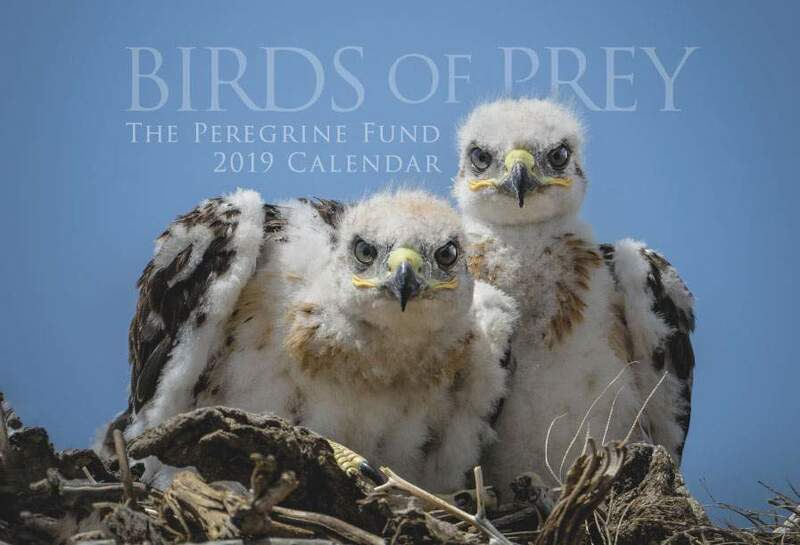 Though The Peregrine Fund doesn't work directly with Golden Eagles, our efforts in scientific research, habitat conservation, education, and community development help conserve raptors on a global scale. We also supply literature to researchers from our avian research library, which helps scientists around the world gather and share important information on raptor conservation. 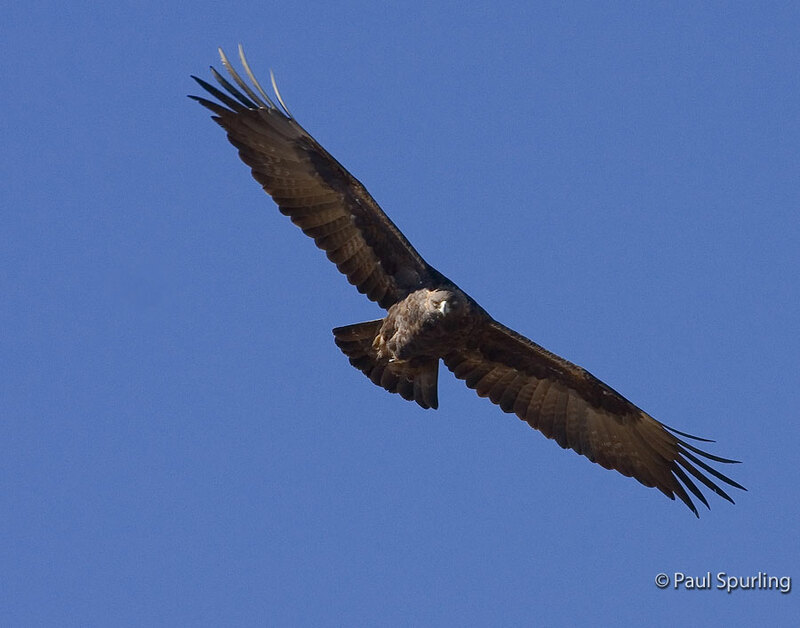 Golden Eagles are found in North America, Europe, and parts of Africa and Asia. They inhabit areas from sea level to several thousand feet in altitude. They are not found in heavily forested terrain, but in open areas of deserts, mountains, plateaus, and steppes, preferably where cliffs or tall forests alternate with open spaces. Like many raptor species, Golden Eagles living in the northern part of their range will migrate further south when colder temperatures set in and their food supply becomes scarcer. Named for the golden hue on their head and neck feathers, Golden Eagles are large, powerful birds capable of fast flight and equipped with keen hunting skills. Scientists believe that a mating pair of Golden Eagles will remain together for many years, possibly for their entire lives. 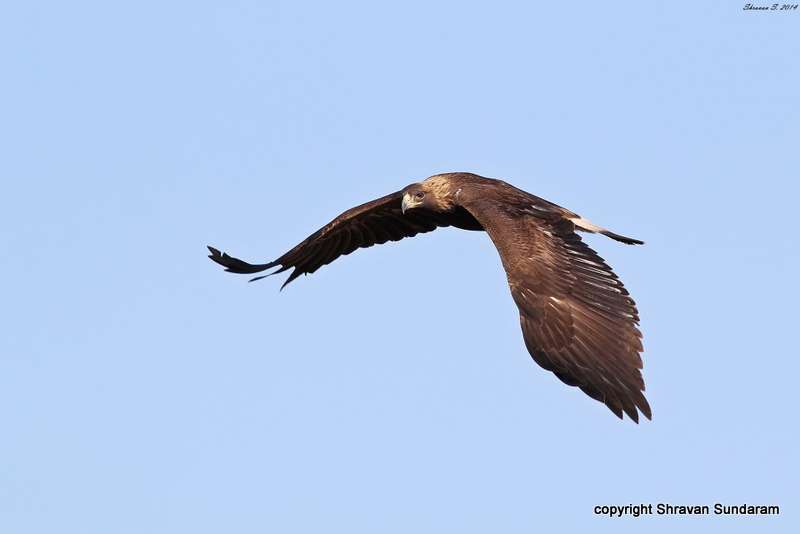 A pair of eagles will maintain a large territory in which they hunt and nest. Before Golden Eagles are ready to settle down and begin breeding, however, they spend their first year of life traveling far and wide. Scientists have learned that during this period the females tend to travel greater distances than the males. In the past, many Golden Eagles were shot because farmers believed that these large birds were a threat to their livestock. Today, Golden Eagles are protected by law to help prevent this from happening again. However, many human activities are still harming this beautiful raptor. 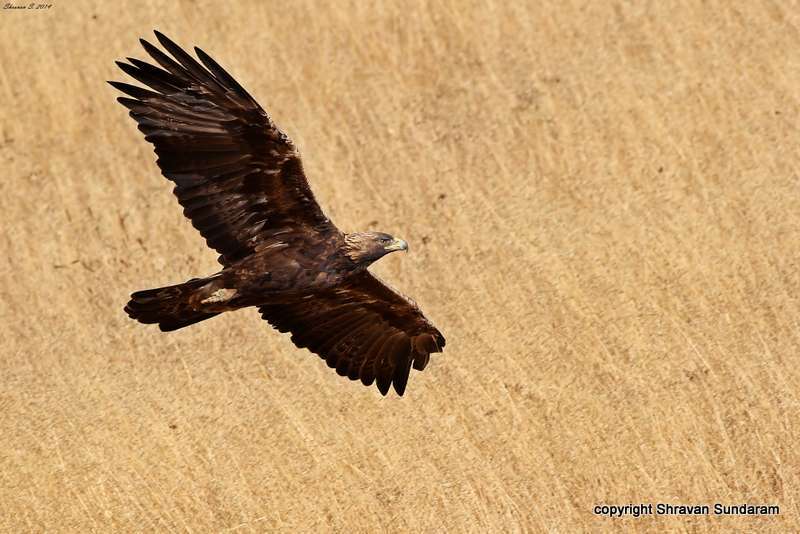 In fact, one study that looked at Golden Eagle mortality over a 30-year period showed that almost three quarters of all Golden Eagle deaths were human related! Habitat loss, shooting, trapping, poisoning, nest disturbance, collision with power lines and wind farms, and electrocution are some of the threats facing this species today. Currently, Golden Eagles are common in many areas but declining in others, including parts of the United States. 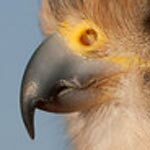 Golden Eagles use their powerful talons, sharp eyesight, and flying skills to hunt and catch a wide variety of prey. 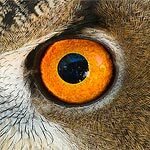 Depending on where they live, they may prey upon medium-sized rodents, rabbits, hares, medium-sized birds, especially game birds, and reptiles. They have been known to prey on other raptors, including owls and falcons. 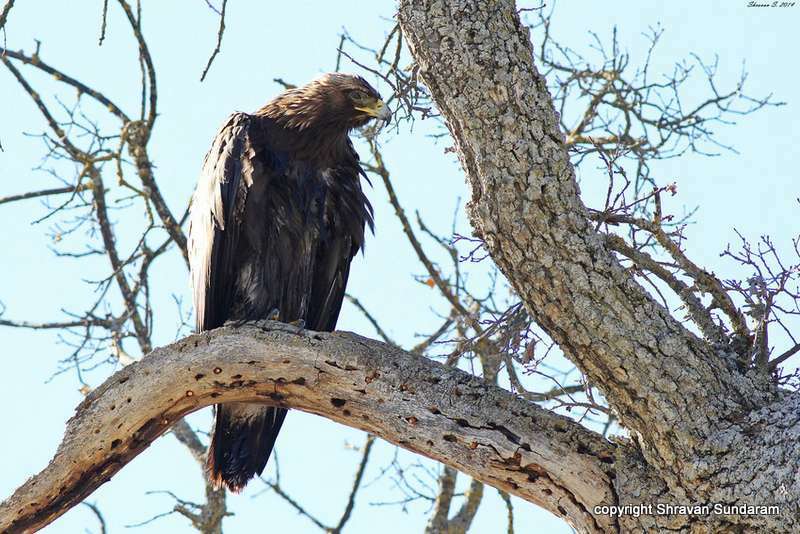 When live prey is scarce, Golden Eagles feed on carrion, or animals that are already dead. In fact, the remains of deer, sheep and other large mammals make up part of the Golden Eagles' diet, particularly in winter. When Golden eagles hunt, they usually capture their prey on the ground from a low flight, but they are fast enough to take birds on the wing. Some Golden Eagle pairs hunt together. Like the Osprey and the Bald Eagle, the Golden Eagle is a champion nest-builder, at least in terms of size. Golden Eagles construct a huge platform of sticks, which they line, or pad, with thinner branches and even hair and grasses. These large birds sometimes build their nests in trees or might use man-made structures, such as an electricity pylon. In Alaska, some Golden Eagles were documented nesting on the ground., but most often they nest on large ledges on cliff faces. 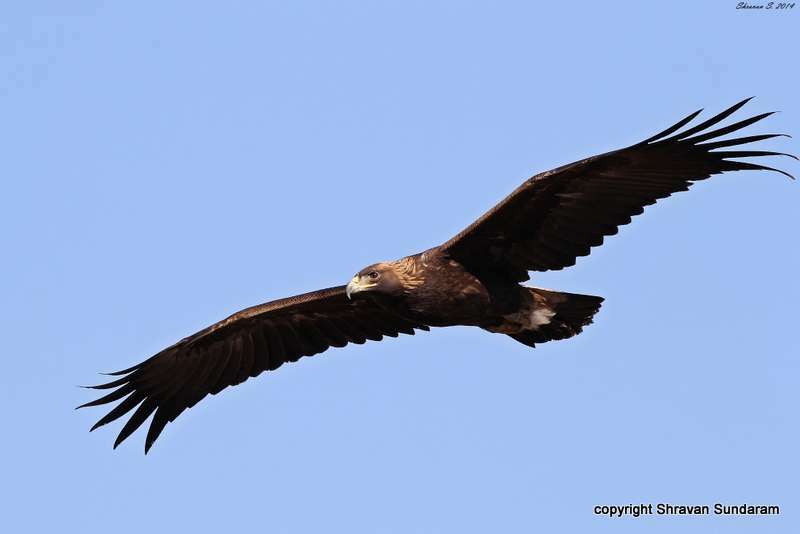 Golden Eagles may use the same nest over many breeding seasons. Each year, they continue to add new sticks so, as you can imagine, their nest can become quite massive after several breeding seasons. When it is time, the female lays up to three eggs, though two seems to be more common. The eggs are large and white and usually marked with heavy reddish-brown and medium-brown markings. The eggs need to be incubated for about 45 days. Though this is primarily the female's job, the male helps out once in a while. As with most other raptors, the chicks are quite vulnerable after hatching to extreme weather conditions. Newly hatched young are covered only with light, fluffy down. Without a lot of feathers, it is hard for them to thermoregulate, or maintain a healthy body temperature, without help. This is where the parents come in. They brood, or sit over, the young chicks. This helps keep them warm when it is cool and provides them shade when the weather is hot. Like most raptor chicks, the young eagles grow quickly. Before they fledge, they spend time preparing for flight by flapping their wings or running around on the ledge or tree branches close to the nest. They fly for the first time at about 2-1/2 months after hatching. 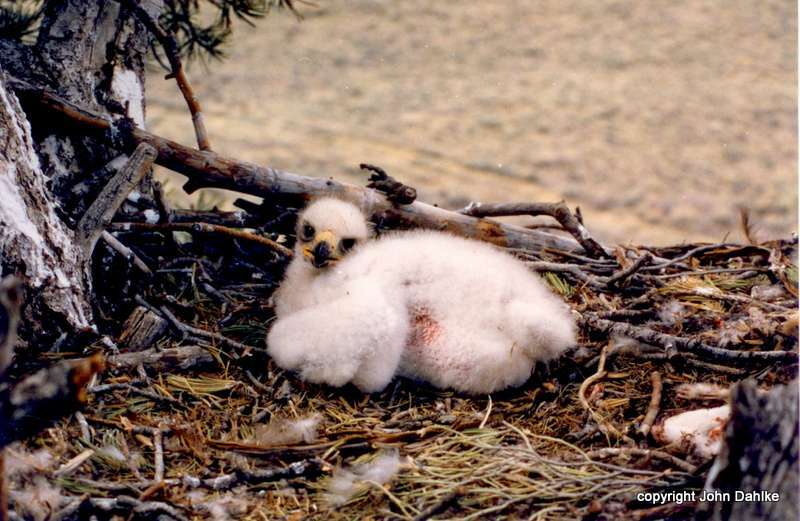 Though one or two chicks may hatch, normally only one chick survives to fledging. 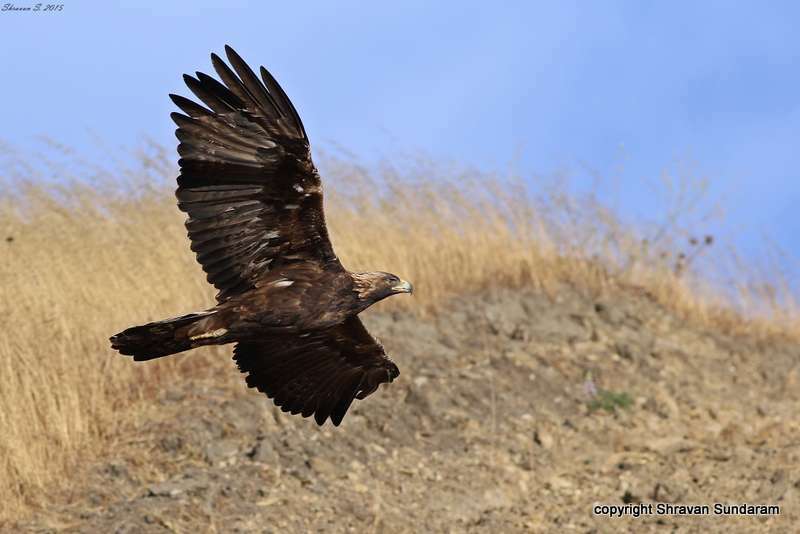 Golden Eagles are year-round residents throughout much of Idaho. 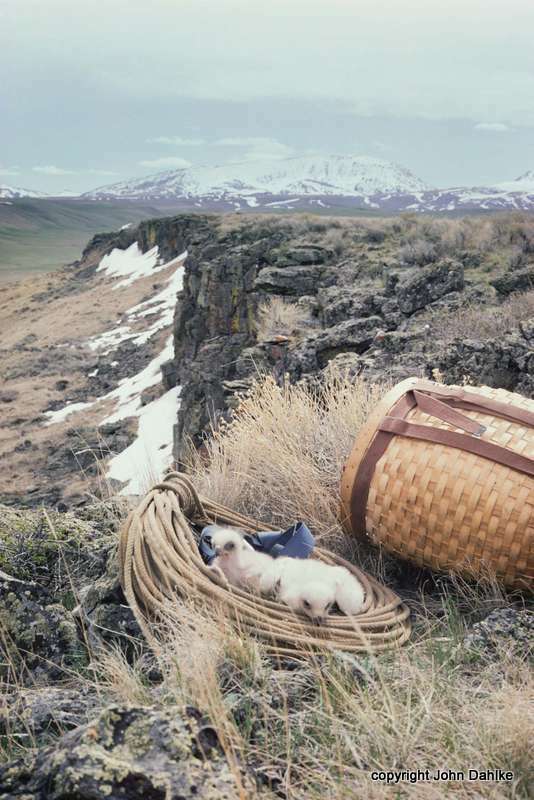 During breeding season in the southern part of the state, they can be found nesting at the Morley Nelson Snake River Birds of Prey National Conservation Area, located about 30 minutes from The Peregrine Fund's World Center for Birds of Prey in Boise. 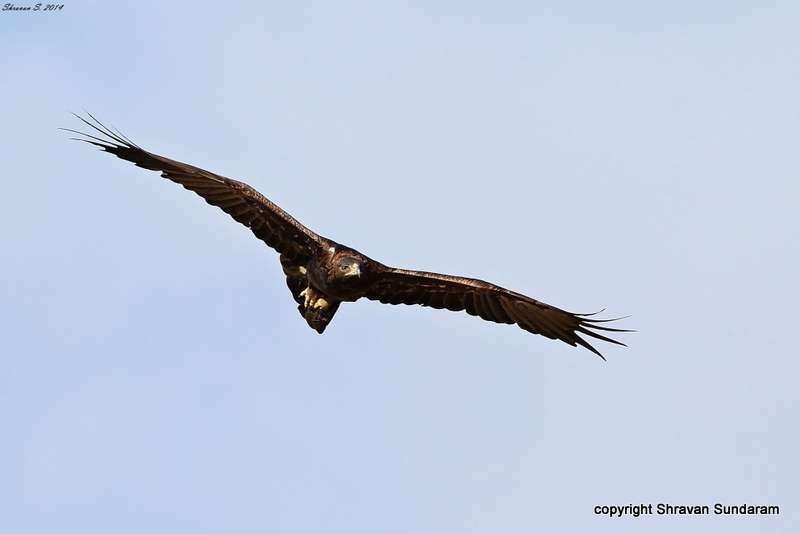 Though not commonly seen, Golden Eagles have been spotted soaring the skies over the World Center for Birds of Prey. During your visit, be sure to walk the interpretive trail or keep an eye on the sky as you drive up the entrance road – you may get lucky and spot one of these large, graceful eagles during your visit.